Here is a list many of the pre-wedding items you may need. This list will also include all the miscellaneous items that don't really fit into any particular category, but are important nonetheless. Of course, there are lots of other supplies that will be needed to make your wedding day perfect. However, many of these things are taken care of by the vendors you will choose for you wedding such as your caterer or the wedding venue itself. If, however, you are totally going it alone, you will need to consider quite a few more things and you will DEFINITELY want to make a checklist of all the things necessary to pull off a successful wedding. This is just a start on all the wedding supplies you might need. It can seem very overwhelming at times. 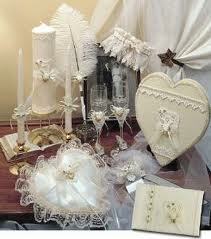 Many times a couple will choose to hire a wedding planner to help with all the details. The wedding planner will know from years of experience all the necessary supplies to make your wedding day a complete success.